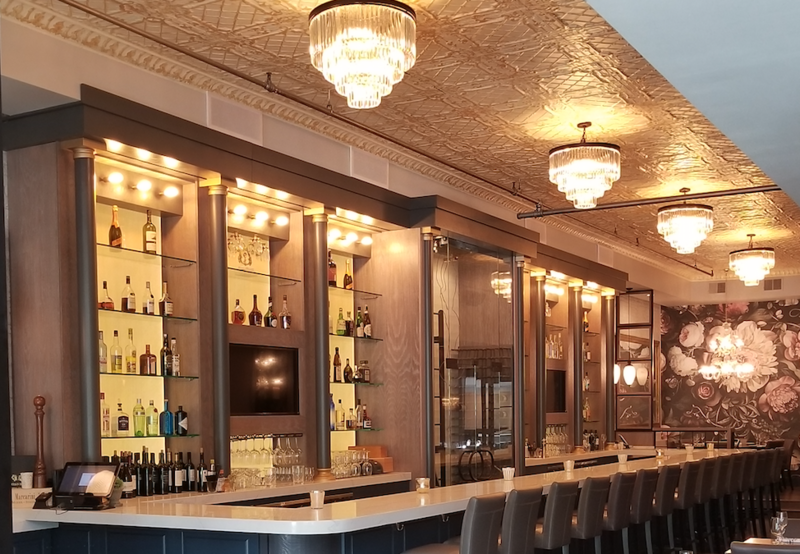 Chicago, IL (June 18, 2018)–PROSECCO, River North’s neighborhood regional Italian restaurant and wine bar, will re-open its doors this week at 710 N. Wells Street. The restaurant quietly closed in March to allow Antunovich Associates to renovate the 10-year-old space. 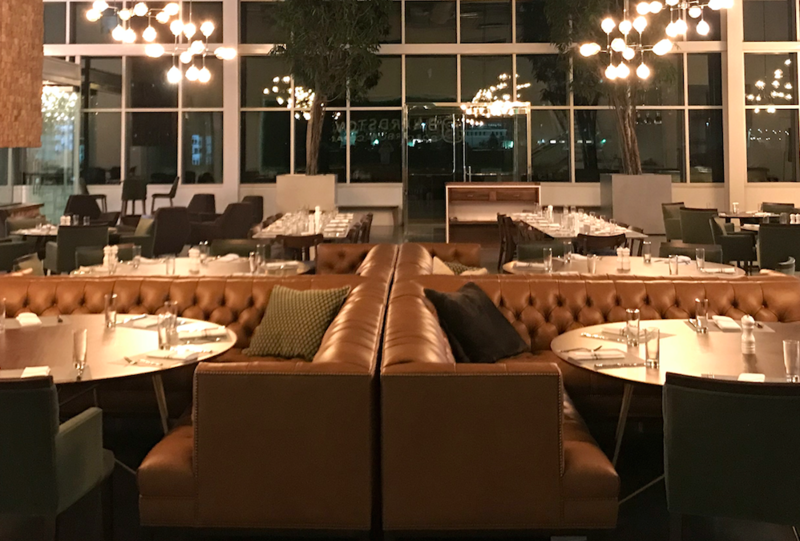 The designers have retained the restaurant’s familiar layout and installed new lighting fixtures, flooring, art instillations, furniture, stemware and a drastic new bar with a temperature-controlled walk in wine cellar and a hand crafted, 35’ long quartz-topped bar. The refreshed restaurant builds upon its traditional Venetian theme with silky grey walls, a mother of pearl colored ceiling with faded gilding, silk paisley curtains, antiqued mirrors and masculine Holly Huntlight fixtures. The two Murano glass chandeliers, in the front of house and above the main dining room roundtable, were hand selected by the restaurant owners on a recent trip to Venice. The art throughout the restaurant is on loan from Arica Hilton of the neighboring Hilton Asmus Gallery. The most popular work of art is one of three The Wolf of Main Street photography prints, displayed behind the host stand, by world renowned artist David Yarrow. Executive Chef Mark Sparacino, who draws upon his 30 plus years of culinary experience, made the current menu more consumer friendly, including headings for: antipasti (hot and cold), house made fresh pastas & risottos, colorful salads, fresh daily fish selections, a variety of both fresh and aged cuts of prime meats and even a dinner for two. New on the dinner menu is the Gamberi Primavera, a vibrant and delightful dish prepared with house made spinach tagliatelle, sautéed shrimp, baby spinach, heirloom cherry tomatoes and a drizzle of pesto olive oil. The new menu will be seasonal, focusing on fresh ingredients. The restaurant will also feature a new and improved cocktail menu headed by Beverage Director, Brian Freeman. One of his favorites is the The Blackberry, which includes muddled blackberries, shaken with Chardonnay and Amaro grappa, ginger liqueur, topped with Prosecco and ginger beer and a fresh mint garnish. The restaurant will continue to offer an extensive Italian wine list, and has added a handful of new selections from France, South America and The U.S., all curated by Wine Director, Sam Geatti. The restaurant still prides itself on offering one of the largest selections of Prosecco in Chicago. PROSECCO will also now be open seven days a week, serving lunch Monday-Friday from 11:30a.m. – 3:00p.m. and dinner service from 3:00p.m. to close. On Saturday and Sunday, the restaurant will offer dinner from 5:00p.m. to close. PROSECCO is also available for social entertaining, corporate lunch and dinner meetings and in-home or office catering. For a special event, the entire facility can be bought out by calling 312.951.9500. Valet parking is available. For more information about PROSECCO and to make a reservation, visit the restaurant’s new webpage http://proseccochicago.com. “Like” PROSECCO on Facebook at https://www.facebook.com/ProseccoChicago/and follow the Company on Instagram @proseccochicago710. PROSECCO is a regional Italian restaurant and wine barlocated in the heart of Chicago’s River North Gallery District. The restaurant servesupscale comfort food from all 20 regions of Italy in a recently refreshed atmosphere. The Venetian inspired space offers one of the largest selections of Italian sparkling wines in Chicago. Antunovich Associates is an Architectural, Planning and Interior Design Firm with offices located in Chicago, Illinois, and Washington, D.C. Founded in 1990 by Joseph Antunovich and employing in excess of 125 design professionals to support projects nationwide, Antunovich Associates is deeply rooted in the belief that creating exceptional buildings is a collaborative process between the Client, the Builder and the Architect. Bardstown, KY (June 4, 2018) – The Bardstown Bourbon Company (“BBCo”), the largest new distillery in America, announced today the opening of Bottle & Bond Kitchen and Bar (“Bottle & Bond”), the first full-service Kentucky Bourbon Trail restaurant and bar in a distillery. Bottle & Bond showcases gourmet fare from Executive Chef Felix Mosso, formerly with the historic Greenbrier Resort, West Virginia, and more than 200 vintage American whiskeys curated by renowned whiskey author Fred Minnick, including some dating back to the 1800s. For the vintage whiskey library, Minnick curated extremely rare gems, including an 1890s Cedar Brook whiskey and a pair of early 1900s Overholt Rye. As part of his Fred Minnick Signature Spirits Series, in which he builds vintage spirits menus, Bottle & Bondis Minnick’s debut library. The Bottle & Bond collection tells the story of American whiskey, through each bottle, from the late 1800s and pre-prohibition through the 1950s, 60s, 70s, and 80s. In addition, Bottle & Bond showcases handmade cocktails, a wine list featuring artisanal wine makers, and craft beer on tap.